In this comprehensive CCNA skills activity, the XYZ Corporation uses a combination of eBGP and PPP for WAN connections. Other technologies include NAT, DHCP, static and default routing, EIGRP for IPv4, inter-VLAN routing, and VLAN configurations. Security configurations include SSH, port security, switch security, and ACLs. Note: Only HQ, B1, B1-S2, and the PCs are accessible. The user EXEC password is cisco and the privileged EXEC password is class. • Configure the WAN link from HQ to the Internet using PPP encapsulation and CHAP authentication. ° Create a user ISP with the password of cisco. • Configure the WAN link from HQ to NewB using PPP encapsulation and PAP authentication. ° Create a user NewB with the password of cisco. Note: The ppp pap sent-username is not graded by Packet Tracer. However, it must be configured before the link will come up between HQ and NewB. • Configure eBGP between HQ and the Internet. ° HQ belongs to AS 65000. ° The IP address for the BGP router in the Internet cloud is 209.165.201.2. ° Advertise the 192.0.2.0/24 network to the Internet. ° Allow all addresses for the 10.0.0.0/8 address space to be translated using a standard access list named NAT. ° XYZ Corporation owns the 209.165.200.240/29 address space. The pool, HQ, uses addresses .241 to .245 with a /29 mask. Bind the NAT ACL to the pool HQ. Configure PAT. ° The connections to the Internet and HQ-DataCenter are outside XYZ Corporation. 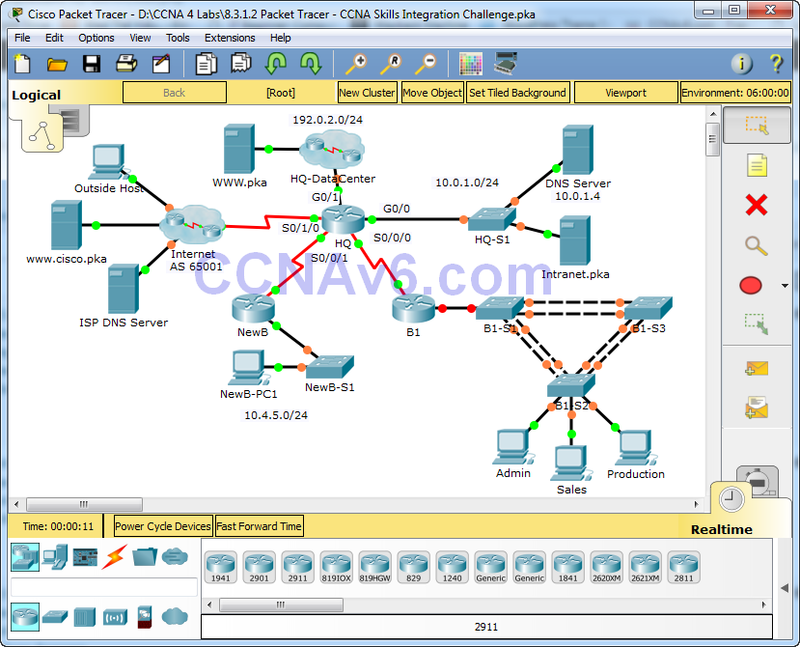 • Configure B1 for inter-VLAN routing. ° Using the addressing table for branch routers, configure and activate the LAN interface for inter-VLAN routing. VLAN 99 is the native VLAN. • Configure HQ with a static route to the NewB LAN. Use the exit interface as an argument. • Configure B1 with a default route to HQ. Use the next-hop IP address as an argument. • Configure and optimize HQ and B1 with EIGRP routing. ° Use autonomous system 100. ° Disable EIGRP updates on appropriate interfaces. Note: Logging to the console is turned off on B1-S2 so that the Native VLAN mismatch messages will not interrupt your configurations. If you would prefer to view console messages, enter the global configuration command logging console. • Configure trunking and VLANs on B1-S2. 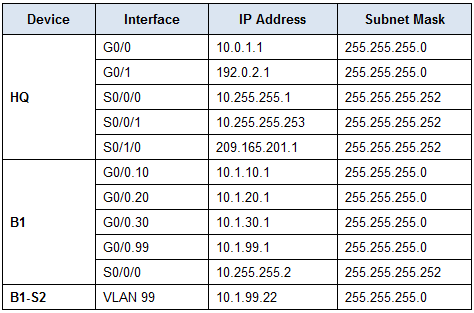 ° Create and name the VLANs listed in the VLAN Configuration and Port Mappings table on B1-S2 only. ° Configure the VLAN 99 interface and default gateway. ° Set trunking mode to on for F0/1 – F0/4. ° Assign VLANs to the appropriate access ports. ° Disable all unused ports and assign the BlackHole VLAN. ° Allow two MAC addresses to be learned on the port. ° Configure the learned MAC addresses to be added to the configuration. ° Set the port to send a message if there is a security violation. Traffic is still allowed from the first two MAC addresses learned. • Configure HQ to use SSH for remote access. ° Set the modulus to 2048. The domain name is CCNASkills.com. ° The username is admin and the password is adminonly. ° Only SSH should be allowed on VTY lines. ° Modify the SSH defaults: version 2; 60-second timeout; two retries. ° Exclude the first 10 IP addresses in the range. ° The case-sensitive pool name is VLAN20. ° Include the DNS server attached to the HQ LAN as part of the DHCP configuration. • Configure the Sales PC to use DHCP. ° Allow inbound BGP updates (TCP port 179) for any source to any destination. ° Allow inbound HTTP requests from any source to the HQ-DataCenter network. ° Allow only established TCP sessions from the Internet. ° Allow only inbound ping replies from the Internet. ° Explicitly block all other inbound access from the Internet. • Verify full connectivity from each PC to WWW.pka and www.cisco.pka. • The Outside Host should be able to access the webpage at WWW.pka. • All the test in Scenario 0 should be successful. I really need this CCNA SIC, and it says that the package is not available, when I am trying to download it, can you please help me?